With over 150 years of Swiss precision watch manufacturing under its belt, the TAG Heuer brand has successfully carved a niche for itself in the world of luxury watches. With a TAG Heuer you are assured a certain level of luxury and attention to detail while enjoying a sporty and hardy look. This is precisely the reason why this long-standing Swiss brand has so many loyal fans the world over. Whether you’re driving, hiking, camping, or sitting at your office desk, a TAG Heuer timepiece delivers elegance, ruggedness, and style. On all these criteria, the TAG Heuer Men’s WAH1110.BA0858 Formula 1 Watch manages to deliver. Keep in mind that while many watch aficionados consider this model is considered an ‘entry level’ TAG Heuer, there is nothing ‘entry level’ about it at all-except maybe for its price. When considering any timepiece, whether it be a luxury time piece or a sporty chronometer, you have to keep in mind style, movement type, and special value-added features. 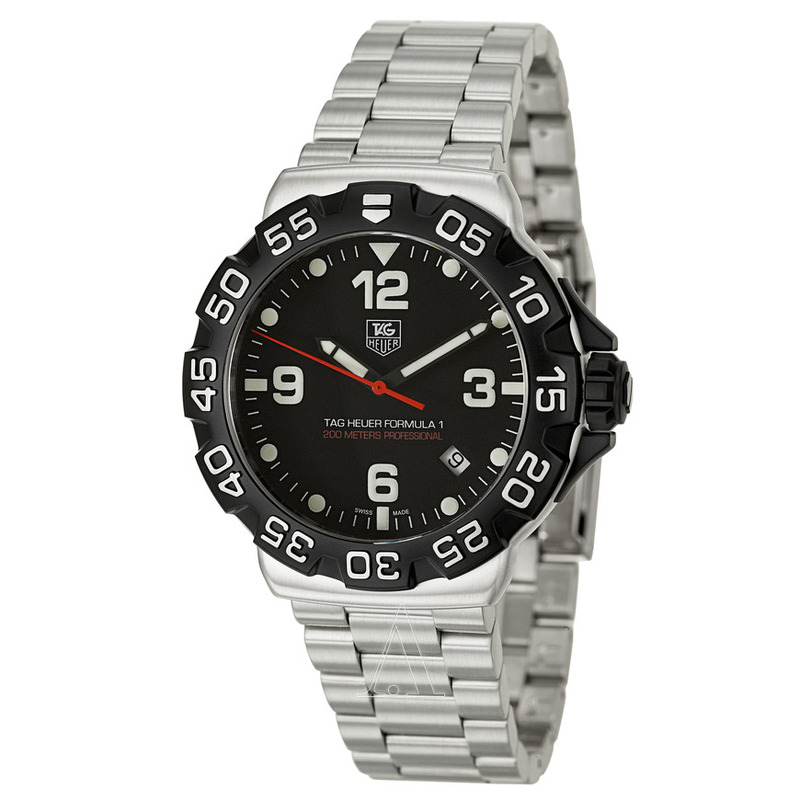 On all three criteria, the TAG Heuer Men’s WAH1110.BA0858 Formula 1 Watch offers solid value. However, if you are looking for a ‘full-blown’ TAG Heuer product with an ‘in your face’ sports luxury design, this particular model might come off as a bit light. Style: 12 mm thick 41mm diameter case. Black dial with silver band. The TAG Heuer Men’s WAH1110.BA0858 Formula 1 Watch has the hallmarks of a typical TAG Heuer product. Sporty bezel? Check. Catchy model name? You can’t go wrong with all the speed and high-precision excitement of Formula 1 now, can’t you? However, the downside to this model is if you have looked at other TAG Heuer models, the overall design doesn’t seem ‘in your face’ enough. Many TAG fans want a certain level of ‘fireworks’ from this famously sporty luxury Swiss watchmaker. Since the TAG Heuer Men’s WAH1110.BA0858 Formula 1 Watch is one of the more affordable TAG products on the market, it might not strike some TAG Heuer or luxury sportswatch aficionados as ‘flashy enough.’ On the plus side, if you would like to wear a sporty luxury watch without looking like you’re going overboard, this is model is a great ‘understated’ selection. Quartz. Swiss quartz but still a quartz movement watch. For many Swiss or luxury watch purists out there, the very idea of wearing something that is (quartz) battery-powered defeats the purpose of wearing a ‘luxury’ watch. In the eyes of many purists, the whole definition of ‘luxury watch’ turns on whether your watch runs on its own or is powered by a battery. Well, there is a trade-off with the TAG Heuer Men’s WAH1110.BA0858 Formula 1 Watch. Sure, it is quartz-powered (albeit, Swiss precision quartz at that), but it is also priced accessibly. While it is far from cheap, this unit is priced low enough that fans of luxury Swiss sports watches can enjoy a genuine TAG Heuer product without having to burn a hole through their pockets. The quartz movement helps make this trade-off possible. Based on this watch’s other features and overall look and style, we think this is a fair trade-off. Limited water resistance. Depth measurement allows you to measure water depth. While this watch comes with a depth measurement feature, it is only water resistant to a depth of 200 meters. Depending on your lifestyle and how active you are, this might simply be not enough. Also, who knows what kind of wear would bring that dreaded ‘misty’ (due to moisture trapped in your watch) look to your watch’s face. This limited water protection is definitely a turn off if you are going to be quite active outdoors with this watch. Asides from its quartz movement and its limited water resistance, the TAG Heuer Men’s WAH1110.BA0858 Formula 1 Watch is a great accessible TAG product. If you want to impress your friends with a fine piece of Swiss luxury sportswatch craftsmanship, you can’t go wrong with this model. It definitely is priced right!